This week the challenge asks us to look down around our feet. You don’t often take photos at that angle so it was a real challenge. I have looked through some old photos and have found a couple of me actually looking down. The first one is at the Queen Victoria Building in Sydney. They have restored this building to its former glory and I love the tiles, so much so that I did look down and took a photo. It was a bit dark and I was using my wide angle lens so had to hold it pretty steady as it ended up being a slow shutter. This gave an added blurred effect to everyone’s feet which I quite liked. 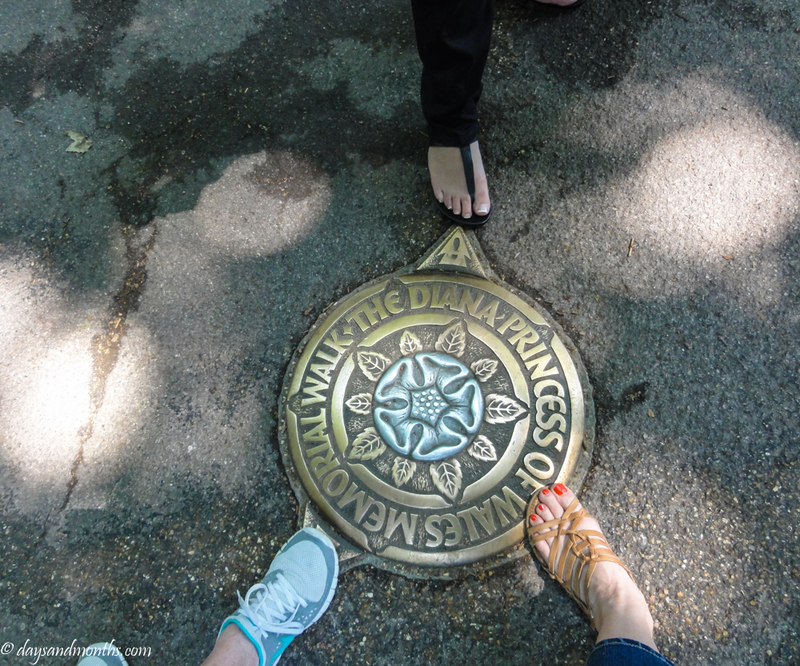 On one other occasion, in 2011 we were in London walking towards Buckingham Palace when my friend looked down and saw a gold circle on the ground which said Princess Diana Memorial Walk so the three of us all put one foot on it as a sign of respect and to celebrate us all being there together. For more weekly “feet” challenge photos, please press the link here to the Daily Post. Pretty! I love such patterns and motifs. I love looking down every now and then because I know many walking paths have beautiful designs. Thanks Lillian, I agree. I think it is a bit spooky looking, a bit eerie. These are great! I love all the blurred feet, like looking through a veil.